PALM Cay, the southeastern New Providence community, is gearing up for the launch of its “next big project” where realtors will have a “big part” to play. The development recently held a VIP broker event to highlight its more than $2m in upgrades to the community’s amenities. 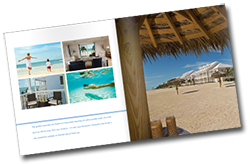 “Palm Cay has always worked with brokers since they opened. We’ve worked with the local broker community and internationally, but have been mostly geared toward the local broker community. With the 2018-2019 marketing campaign we’ve put together, the local broker community is going to be a big part of that,” said Myles Newell, Palm Cay’s recently-appointed director of sales and marketing. Palm Cay recently announced the release of its latest real estate offering, the $100m condominium and penthouse complex named One Marina, which will overlook the marina and ocean access. One Marina was 40 percent pre-sold before its release to the general market. Construction, according to Mr Newell, will begin in 90-120 days. “One Marina is our next big project. It’s a completely new product, with new architecture and new design,” he said. Mr Newell added that Bahamian buyers have taken up much of the Anchorage condominiums given the price point. “There’s always been an active local Bahamian real estate market that has been been buying into the condominium project,” he said. Palm Cay has already had 160 properties purchased since opening, with the developers investing $65m. The community covers 69 acres in total, and is located in southeastern New Providence between Port New Providence and Treasure Cove.